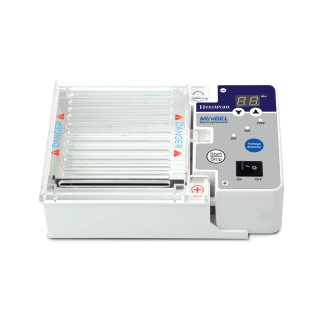 TT-HES-1 MiniGEL Electrophoresis System is a compact, easy to use all-in-one electrophoresis system. It is completed with all components required to cast and run horizontal gels, including gel trays, combs, casting stand, gel tank and digital power supply. 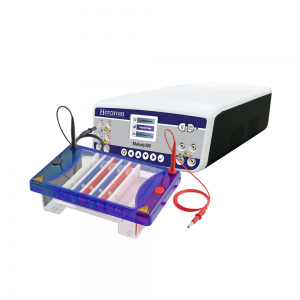 The power supply attaches directly to the gel tank without requiring power cables and save valuable bench space. A magnetic sensor allows current to flow to the electrodes only when the lid is in place. Current immediately shut down if the lid is removed during operation. The lid is vented to dissipate heat produced during operation. Double sided combs are included in the system. The smaller tooth combs are compatible with multichannel pipettes. The gel tray features a dark contrast strip to aid in visualizing wells while loading and lines that fluoresce under UV or blue light to keep track progress of the run.